Sheridan students had the opportunity to learn about the conservation of pollinators on Sept. 27, at the Give Bees a Chance workshop. 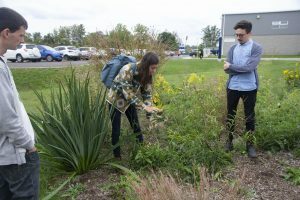 The workshop, run by Kathleen Law, was held in a Sheridan College classroom, and attendees got the chance to walk Sheridan’s medicine gardens in search of bees and the plants they love to pollinate. The workshop’s purpose was to educate students about the decline of bees and other pollinators, and what people can do to help save them. 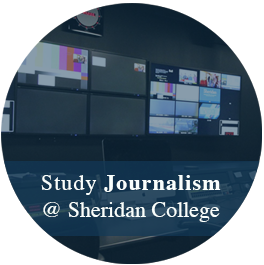 Part of Sheridan’s new biodiversity initiative, the workshop shared a variety of information from what type of bees are the best pollinators, to why we should care about their decline, to what’s the next step to take for a better, pollinator-filled future. Wai Chu Cheng, Sheridan’s Mission Zero program coordinator, believes that coming to these workshops is an important part of saving the environment. Mission Zero has many programs aimed at helping the environment, and first started having their bee workshops last year. “We hope next year we do it again, a similar workshop. We did a trees and bees workshop last fall and I think it’s a good way to educate people about conservation of pollinators,” Cheng said. The workshop taught that pollinators are responsible for the reproduction of plants by transporting pollen from one plant to another. Pollinators include bees, butterflies, birds, and bats, but the one most responsible for Canadian produce is the bees. Without bees 30 per cent of produce is gone and the remaining is smaller, less sweet, and a poorer quality than what we’ve experienced in decades. The bees responsible for pollinating are not what you would expect. Besides the honey bee, a species not even native to Canada, most people can’t name other bee species. The workshop brought approximately a dozen attendees out to Sheridan’s medicine gardens to teach us specifically about five different kinds of bees. Kathleen Law points out a bee pollinating. Kathleen Law, the outreach program manager of Pollinator Partnership showed slides explaining North American’s bee population and their purposes. The honey bee, the poster-child of bee education, as well being the most researched, are native to Eastern Asia. The most well-known bee, they are heavily commercialized and bred. As their name suggests, the honey bee is responsible for pollinating crops to make honey which is then sold to markets. The second well known bee, the bumblebee, has several native species in Canada, including the rusty patched bumblebee. The bee is one of the first bee species to be put on Canada’s official endangered animal list. They have experienced an 87 per cent decline in the past 10 years. The rusty patched bumblebee will soon be extinct. Another bee, the blue orchard, is stunning with a bright, blue body. This bee is commercially bred. The blue orchard is a solitary mining bee, meaning it doesn’t live in hives. The bee lives its life alone and underground, only coming up for food. One blue orchard bee does the pollinating work of 250 honey bees, the workshop taught. Next is the sweat bee. With a tiny, green body, the sweat bee is quite common but rarely seen. Also solitary bees, the sweat bee is responsible for pollinating flowers in your very own garden. This bee is attracted to the saltiness of human sweat and loves to buzz around your head on a hot summer day. The final bee, the leafcutter bee, is commonly seen in gardens. They cut perfect circles in leaves and other foliage to line the inside of their nests. These bees are solitary but good pollinators to keep around your garden. These five are the most well-known bees, but not the only ones. There are over 800 species in Canada. But the question is why are all these bees on the decline and not only in Canada, but all over the world? 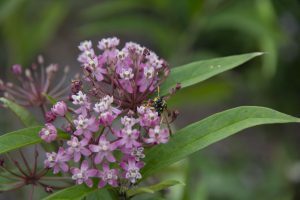 A wasp pollinates a plant in Sheridan’s medicine garden. Most scientists don’t have much more than theories. Law believes it’s due to climate change, loss of habitat and agricultural intensification. But she believes there are a lot of small ways to help in our own community. “Look at all the spaces where you can have a direct relationship with a little piece of land where you can take care of it. 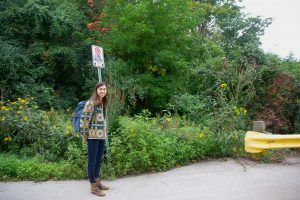 Maybe you’re picking up garbage, maybe you’re protecting it, maybe you’re looking at those spots in your community where you know, there was some bare ground or maybe there’s just turf grass and it came to make some biodiversity.” Law said. 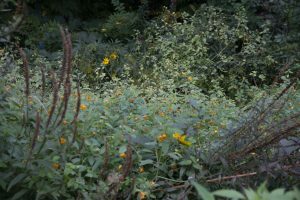 Diverse plants in Sheridan’s ditches. Education and knowledge are the best way to save the bees. Researching and knowing what can help them, and coming to workshops like Give Bees a Chance, or becoming part of initiatives like Pollinator Partnerships are important to creating a better environment for our future. Law believes the best way to save the bees is coming together as a community. i love this article. It has moved me to take the advice re making an environment more friendly to bees.